In 1999 the Walt Disney Animation Studios released “Tarzan,” which would be its final major animated film during the Disney Renaissance era that began a decade earlier with “The Little Mermaid.” Based on the Edgar Rice Burroughs novel “Tarzan of the Apes,” told the story of the boy raised by apes, who meets naturalist Jane with whom he falls in love. With the extreme success of translating films like “Beauty and the Beast” and “The Lion King” into Broadway smashes, Disney Theatricals tried its hand at transforming the film with just a few songs by Genesis lead man Phil Collins into a full-fledged Broadway production in 2006. With an expanded score and additional songs from Collins, the producers turned to David Henry Hwang (M. Butterfly) to adapt the film with an emphasis on more intricate choreography and special effects. The result was a musical that played a little over a year and half before Disney pulled the plug, establishing it as one of its less successful vehicles. The Jefferson Performing Arts Society opened its production of Tarzan: The Musical this weekend with a cast that includes the remarkable James Royce Edwards in the title role. With a huge chiseled chest and bulging arms, Edwards is well-suited to portray the ape man, a role he has played regionally three times previously, including a six-month, sold-out run at the Tuacahn Amphitheater in Utah. Edwards swings across the stage with absolute authority in this production directed and choreographed by Kenneth Beck. He happily does somersaults at the drop of a pith helmet, while prancing around on stage in a loin cloth that leaves little to the imagination. His voice is as agile as his physical prowess on the swinging vines choreographed by Paul Rubin. Indeed, his character is fleshed out from the moment he literally swings on stage until his final bows and somersaults. 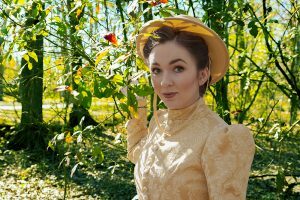 Christian Tarzetti, who performs as Jane Porter, also possesses an incredible instrument with a British accent that seems as natural as the fauna she surveys early in the musical. Their love duet of “Everything That I Am” is a fitting denouement to the action in the script. But the script is the one area in which this production suffers. Hwang’s adaptation seems to fire in fits and starts and the second act in which the morals of man and ape seem destined to be resolved in a mighty clash of cultures fails to deliver. John Michael Haas as Clayton is supposed to be the foil to Tarzan and his ape family. Yet, he is prevented from hatching his plot to sell members of Tarzan’s ape family and even subdue the hero in an almost matter-of-fact fashion by Edwards as Tarzan. Louis Dudossat as Kerchak, the leader of the gorilla tribe, shows an incredible amount of stamina as he sings and promenades around stage in one of the many beautifully-rendered costumes designed by newcomer Emily Billington. Luke Halpern as Tarzan’s ape friend Terk and Marie Becnel as his surrogate mother Kela also sing and dance in costume to great effect. Butch Caire as Jane’s father Porter is wonderful comic relief, but the script keeps him behind stage until the second act. This is another shortcoming in the Hwang’s script. When Caire is onstage, he is quite delightful and quite the role model for his stage daughter. Nevertheless, the scene in which he finally meets up with the tribe of gorillas after searching for them on safari for weeks, fails to achieve a critical mass and fizzles almost as soon as it starts. Youngster Wesley Adams as the young Tarzan is a standout in act one. His training as a JPAS Theatre Kid is obvously paying off in droves. With maestro Dennis Assaf on baton, the JPAS Symphony Orchestra sounds wonderful and Donna Clavijo, as the musical director, makes the orchestrations work. While Collins has proven to be a remarkable pop writer, his most popular songs from the original animated film – “Two Worlds” and “You’ll Be in My Heart” – are reprised in the musical, giving the impression that additional material could have been written to complement the musical version. The songs are good, but they pale in comparison to scores written by Elton John or Alan Menken with Howard Ashman and others. In terms of the book and the score, we know what Tarzan: The Musical isn’t. But this is a big vehicle by JPAS with lots of amazing flying and aerial sequences by Bobby Hedglin-Taylor and impressive lighting designs by Jean-Yves Tessier. It also boasts well-executed projections by Andrew Schmitz, exciting special effects by Brian Debs and superb sound effects by Jamie Doyle. The dancing of the gorillas in key scenes as they fly through the air or cavort on stage is especially noteworthy and the tremendous choreography by Beck cannot be overstated. The performances of the major performers are all top notch and the technical aspects of this production are very high. Indeed, the faults with this production have little to do with the local team at JPAS. With a more polished script and some additional musical numbers Tarzan: The Musical might have achieved the kind of greater success on the Great White Way like that enjoyed by present-day Disney productions of Aladdin and The Lion King. The Jefferson Performing Arts Society’s production of Tarzan: The Musical completes its run at the Jefferson Performing Arts Center, 6400 Airline Drive in Metairie, LA. Tickets are available here. For more information, call 504-885-2000.